In the spring, duck hunting is the most exciting , emotional and interesting. In most cases, it is allowed only with a decoy duck. Usually, such a hunt begins even before the bird starts nesting. It happens that hunting occurs at the time of laying eggs. Therefore, hunting in this period is limited. 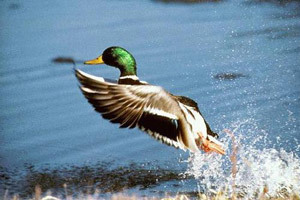 It is important to approach the spring hunt correctly, otherwise the number of carrying ducks may decrease. In the spring you can only hunt drakes. We must be able to distinguish them, since they are very similar to ducks. 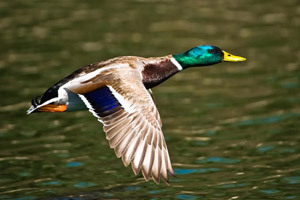 The ducks have an average body size, the neck is short and graceful, and the color of feathers is varied. The head of the duck is more rounded. Females on average reach up to 3-4 kg of weight. Drakes also have large dimensions.Externally, their body, neck, wider and more voluminous . The average weight is about 4 kg. The color scheme is much brighter. The head of the drake is oblong. Drake and duck have a huge difference in voice . One has only to listen: the cry of the female is in full voice, not restrained, and the cry of the drake opposite is spiked and whistling . The tail of the drake forms a ring of feathers, the female does not have this trait. Also, duck, unlike duck, has pseudopenis. Ducks after arrival are based in flocks. Ducks are preparing for laying, and drakes are kept alone. You can advance to explore the water places , after the ducks arrived from wintering. This is best done at dawn, or before sunset. Intelligence will provide an opportunity to determine the favorite places ducks . 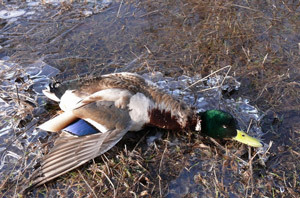 The choice of a place for duck hunting is determined by special rules . Usually, the space is selected, near which ducks fly and sit down. At such a place, the landing of a stool duck on water should be possible, and also it should be allowed to float freely. It should be visible flying drakes . It is important that the main course does not flow through the chosen hunting area , so that the decoy duck and stuffed animals are not knocked down by the current. A calm bay, or meadows filled with water, will work well. Hunting is best done in the morning and evening dawns . To sit down in a hut should be in advance, before the onset of flight of ducks. In the morning – at dawn, in the evening – before sunset, when you can accurately see the differences on the water of the decoy duck from the drake. When it is cloudy, the drakes can fly throughout the day . In this case, it is possible to hunt with a decoy all day. With such a hunt, it is good to have two decoy ducks, alternately replacing them so that each can rest. Preparing for the hunting season , it is necessary to check the technical condition of the gun and the availability of suitable ammunition. It is also important to take care of special shoes and clothing. The success and the result of the hunt, as well as the safety of the hunter and people, depend on every detail. when hunting from a boat you will need 2 types of clothing. When moving at oars at large distances in the cold, 2 sweaters or a sweatshirt, wool socks (warm socks), warm trousers are worn. You need to put in the boat : stuffed animals, cartridges, number of seats, spare pole or paddle, knife, hot tea in a thermos, matches, a lantern. If hunting with a primarny duck is planned, then it is necessary to establish a hut for duck hunting . Hut is usually made from scrap materials. The main part consists, as a rule, of branches. The hut itself is covered with dry grass or reeds. It is possible to use any fabric of a protective color, and cover the top with dry grass. All the slots of the walls of the hut are covered with dry grass, it can also be laid on the ground. The hut should be roomy. Hunters should be able to use a gun from the hut, not showing the protruding trunks . Sometimes, it takes a lot of time to find the right place for a hut. We need to look around, find the largest flock of ducks. If you put the tent face to the dawn, then you can see the drakes that sit down to the ducks . An alternative to the hut can be a hole , which is dug about about one meter deep and wide. Part of the land is left for the hunter’s seat. Edge masked by grass. Often in the hunt for ducks practice the principle of decoy duck. It was noticed that it is best to use the breed of “Tula” ducks. This breed can be purchased. To do this, you must go to the district society. It clarifies the presence of a decoy duck from hunters, or in hunting farms. It should be remembered that for the purchase of this bird, the ideal period is the end of September – the beginning of October. During such a period, all ducks passed the control, and the best were selected for wintering. The priority sign in the selection of the decoy duck is her voice . It must be clear, clear, without any hindrances. It is also necessary that it does not have strong differences from wild ducks in external signs (body size, color of feathers). It is good to make the purchase of one drake and two ducks . Keep should be in a clean shed, moderately luring. It is important to accustom the decoy to the hands of the owner . During the warm period, the ducks are trained to nogavke . It should firmly surround the duck’s leg, while not squeezing. After a period of getting used to the leggings, the string is tied. The duck is squatted on a puddle, and the other end of the twine is strengthened on a peg inserted into the ground. It is desirable that in warm weather duck could swim in the water . The duck should not be afraid of shots, for this it needs to be accustomed to it. It is important that she not be hungry in the hunt, otherwise she will not scream. On a hunt, a decoy duck is knotted to a stick inserted into the bottom, a circle is made of wood (so that the duck can rest). The duck on the water is launched slowly, making sure that the foot is firm. After hunting, the duck is released on the ground for additional feeding. At night – planted in the tank. There is a curious option to hunt using stuffed animals . It is necessary to fix a number of scarecrows on a string, with an interval of 1-1.5 meters. Attached to the ring is a waxed rope, the length of which is 30-40 meters. Then the ring is placed on the bottom of the first stuffed tree. According to this string, an anchor moves on the ring, its weight is 300 g. The opposite end of the string is fixed to a stick or a bush. The hunter drives the anchor with the ring to the middle of the string, then throws it into the water. Anchor falls to the bottom. Further, the hunter, sipping the end of the twine, releases the stuffed animal into the water, in the interval 15-20 m from the hut. Wooden stuffed animals should be dried after each use and inspected to track the formation of holes . It is inconvenient to use a scarecrow while hunting, if the weather is windy . They roll over. It is recommended to choose a place fenced from the wind.